In the world of Ayurvedic medicine, CCF Tea leads the way as a digestive remedy that is powerful, yet gentle enough for all dosha and body types to use on a daily basis. 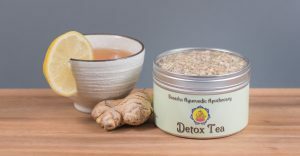 This savory, but oh so tasty tea is perfect for drinking between meals to flush toxins from the system, kindle the Agni or digestive fire, and reduce chronic symptoms of indigestion such as gas, bloating, cramping, hyperacidity and malabsorption. Its natural diuretic properties also make this tea a great tonic for the kidneys and bladder, reducing fluid retention and swelling in the body. So what does the CCF stand for? 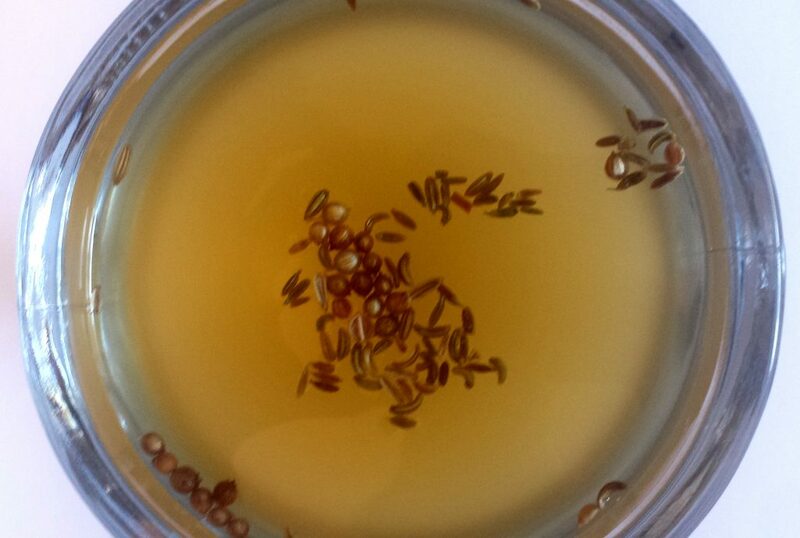 Respectively, cumin, coriander and fennel seeds, often steeped in their whole form. Although traditionally CCF tea is made using equal amounts of each spice, I more often recommend cutting the cumin in half, as it is the strongest and most heating of these three Ayurvedic spices. This is especially true for Pitta types as taking in too much of the cumin may increase acidity and heat in the system, rather than pacify it. In fact, those with a strong Pitta imbalance can reduce this amount even further, adding only a pinch to the entire recipe (see Pitta modifications below). This classical Ayurvedic remedy offers relief for a wide variety of ailments and I must admit, I prescribe it to my clients more often than not. The main benefits are mostly relating to digestion, whether one is suffering from gas, bloating, constipation, loose stools, inflammation, toxins, fluid retention, or anything in between. However, this tea possesses a few hidden benefits such as promoting healthy breast milk, making it a great choice for new moms too! Anyone with a current Pitta digestive imbalance such as hyperacidity should reduce the amount of cumin in this recipe, or omit it altogether. **Pitta types may do better with less Cumin due to the heating factor. Feel free to reduce this amount if needed. 1. Heat the water in a medium size pot. 2. Once boiling, add in the cumin, coriander and fennel seed in their whole form. 3. Reduce the heat to a simmer. Cover the pot, leaving only a small crack. This will allow the tea to steep without loosing too much water. 4. Steep the tea on a simmer for at least 7-10 minutes. The longer you steep, the more potent the tea will be. 5. For a super potent brew, you can double the water and let the tea simmer on low until only 4-5 cups remain. This may take a few hours, but will leave you with a powerful detox-digestion tea to drink throughout the day. 6. Once you have found your desired potency, strain the seeds using a fine mesh strainer. 7. This should yield about 4 cups of tea. It is recommended to drink this tea first thing in the morning and between meals consistently if you are dealing with chronic digestive issues or a large amount of toxins in the body. One of my favorite variations for this tea is to spice it up even more by adding in some ginger. For this recipe you can add in about a 1.5 inch cube of fresh ginger grated (best for Vata and Pitta types) or 1 tsp of dry ginger powder (best for Kapha types) and steep with the original ingredients. I’ve been drinking this the past several days. Not only is it delicious, I find it both calming & soothing. Though I’m Pitta/Kapha, it hasn’t irritated Pitta, so its a winner for me! Hi Amy! I am so glad you are enjoying this simple, yet powerful tea blend. It is definitely a winner for me too:) This tea is considered tri-doshic, however, some people are more sensitive to the cumin than others. Otherwise, it is good for all types and all seasons. Keep up the great work my friend! Hypothyroidism is a huge issue and luckily Ayurveda does have many natural treatment options. The only product that we carry would be the Trikatu Churna, as this will help rev-up the metabolism and help with the symptoms. Some other herbs that will be more specific for Hashimottos however are as followed: Guduchi, Ashwagandha, Kanchanar Guggulu, Shilajit, and Chitrak. The first two listed are good for balancing TSH levels, but also for autoimmune disorders. Kanchanar Guggulu however, may be the best out of the bunch. Besides guduchi, many of these herbs are considered heating and Pitta-provoking. Therefore they should be taken with caution and with cooling herbs or substances such as Aloe juice. I hope this can give you a good place to begin. Many blessings to you! Danielle, thanks for your response. I was Vata growing up : under weight, bony, baby thin hair, cold all the time, hyperthyroid, menses at age 16, irregular menses as adult, under developed at age 18 OMG I hated myself lol. I was thin until I started having kids (4) but I would get skinny again. At 50 I started menopause, gained weight, hormones out of whack, hypothyroid, loss of hair, hot all the time, anxiety, depression, fatigued, OMG lol. Now at 62 , over weight by 20 lbs, exhausted, depressed, heart issues, high blood pressure, high cholesterol, osteopenia, GERD, sleep apnea, i think that’s it. Now I’m vata/pita I would say. Not sure what to do. I’m miserable Any suggestions would be wonderful. I am an RN but had to retire due to health issues started 2016 (heart). Thanks and Blessings to you. I am new to Ayurveda. Came across your site searching for causes of splitting nails. I have longitudinal lines on nails. Would this tea work for malabsorption ? Looks like I am Kapha with an imbalance of all three doshas! Thank you for writing in! This tea will be beneficial for taking during times of malabsorption and weak digestion. It is also tri-doshic, so it looks like it will be an even better choice given your imbalance. Ideally you should be drinking this tea daily between meals for best results. If the malabsorption is severe, you may need to administer other treatment as well to flush toxins and increase the digestive fire, which is likely what is causing the malabsorption. Feel free to read some more ideas on how to improve absorption here! At first I would like to thank you for this amazing website and valuable information that you so generously share with us, readers! I found so much practical guidance just from reading your posts! I am also greatly inspired by your kindness and friendliness in answering the questions of your readers! You truly put your heart into what you are doing! Here I have a question for you: recently I went to an ayurvedic physician and after examinatin she told me that my body is full of toxins, but at the same time too weak to be able to undergo a pancakarma therapy, which she normally prescribes in such cases. And yes, I do have digestion and malabsorbtion issues, often feeling lethargic, fatigued and heavy. My constitution is vata-pitta, and now both are disturbed, especially vata, and also kapha is out of balance. I am 53 now, already in menopause. So, what can I do to gently detoxify my body? Thank you for your kind words. This is a great question, as many individuals are not fit for a powerful detox regimen due to weakness, Vata imbalance, age, etc. Luckily Ayurveda is well prepared for these situations and offers instead something called shamana, which is simply palliative therapy (rather than shodhana which is detoxification). For shamana, mild detoxification medicines can be taken such as this CCF Tea. 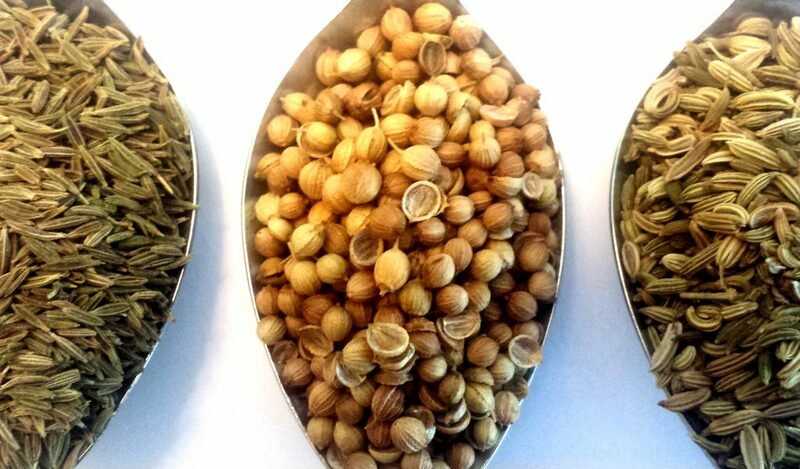 You can also take Triphala Churna before bedtime and/or Triphala Ghrita in the morning. These medicines are cleansing by nature, but also possess a rejuvenation quality and therefore will not increase weakness or provoke Vata. Other methods of shamana include abhyanga (the Ayurvedic oil massage) or routine sweating via steam, sauna or ginger baths. Adding digestive spices (turmeric, ginger, cumin, fennel, coriander, cinnamon, etc) to each meal is a gentle way to boost the digestion and aid in mild detoxification. Drinking fresh ginger tea or even hot/warm water with lemon or lime first thing in the morning and between meals is another great shamana therapy. Although there are many methods for applying shamana, these suggestions can be a great place to begin! I would recommend picking out a couple and beginning there.